We bring forth a range of POWERCHLOR NA Chlorine Tablets that is available in effervescent and non-effervescent forms. 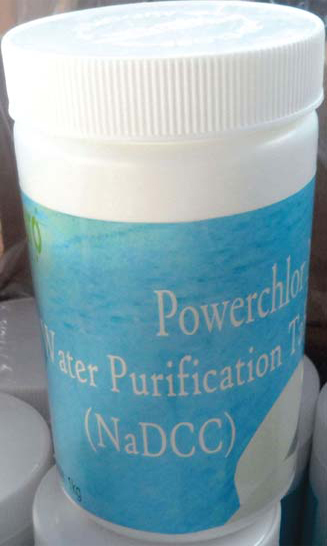 Primarily used in drinking water disinfection and other chlorination applications, these POWERCHLOR NA Chlorine Tablets are widely demanded by the clients. Besides, these chlorine tablets are also priced competitively. Accurate : always yielding the stated level of available chlorine. Convenient and easy to use. Just add to water and allow to dissolve. The speed of solution can be enhanced by the use of warm water and/or by stirring. Economical in use : the tablets provide an easy to use dilution system that eradicates the over-dosing that is common with liquid bleach and more importantly minimizes any under-dosing potential. Easy to store and distribute - no spillages, no leaks. Much safer to use than liquid bleach - reduced risk of accident and personal injury. Less corrosive than liquid bleach. Tests have shown that nearly all metals in common use are more readily corroded by liquid bleach than by POWERCHLOR Na tablets. Possess greater biocidal properties, strength for strength, than liquid bleach, especially in the presence of soiling. Product being used by leading dairy firms. They use different ppm at different places but you can assure them, that they can use 50% less ppm than what they are using at present with liquid chlorine or bleaching powder.